Buy Green City Cinnamon Sticks - 14 (3 or 4 sticks) in the UK from our online shop or directly from our independent Scottish store. You can use cinnamon sticks both in sweet or savoury cooking. This chutney goes well with Indian foods, like curries, dahl or cheese. I made this chutney last year and it tastes great, even if I say so myself! What’s even better is that it’s a great way of using up any green tomatoes! This recipe contains 1 Cinnamon stick. Where can you buy real Cinnamon Sticks - 14g safely online? 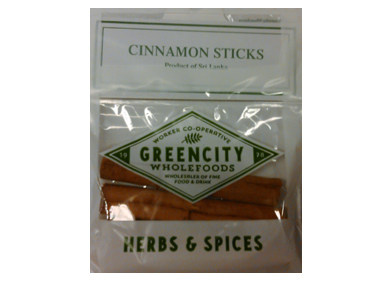 If you are wondering where you can buy Green City Cinnamon Sticks - 14 (3 or 4 sticks) safely online in the UK, then shop with us. Cinnamon Sticks - 14g - Green City Cinnamon Sticks - 14 (3 or 4 sticks) in Herbs & Spices and Herbs, Spices & Salt.